Authored by broulik on Feb 1 2019, 3:20 PM. 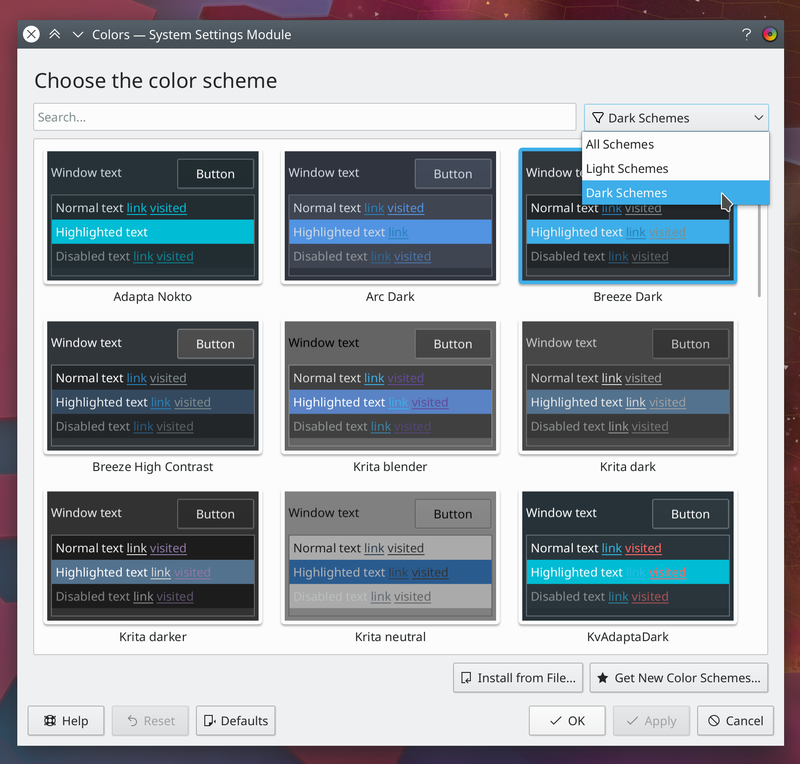 This adds a search bar to search for schemes in the list as well as a filter to show only light or dark themes using a heuristic on the theme's window color. 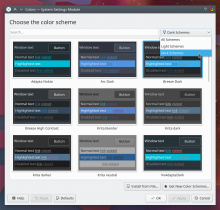 Should the filter be cleared when you install a new theme to avoid it being hidden by a filter? Alright, will change it to a ComboBox. We might lose the filter icon, which I quite liked, in the process, though. UI and interactivity are great. Very nice addition. Would be nice to have the search field as a re-usable component, yes. As in D18716: Add an ActionTextField component. why do we need a different approach from the way you've done the clear button? If I could change the left padding of the ComboBox button I would have done that and placed an icon ontop. However, since it's all painted as a monolith by KQuickStyleItem I cannot. It doesn't follow the padding properties because it's all derived from the QStyle, and changing that opens a can of worm imho. UI-wise, I think this can go in. It does kind of beg the question of why this is the only grid view that has a search, of course. Dunno, colors has significantly more entries than the other KCMs. LGTM aside from the minor naming nitpick. Why did you call this setSourceModelProxy? QSortFilterModel::setSourceModel is virtual, you could do the emit in a reimpl? The selectedSchemeIndex stuff doesn't take into account the filtering, so the highlight is wrong when filtering and also when marking a theme for deletion the index changes to the next one but might end up applying a currently invisible theme..